← ‘Cerberus’ Manfern spotted in Tasmania’s Northwest! Hybridization as a means of making new species is not an uncommon concept and hence it must be applicable to other species. 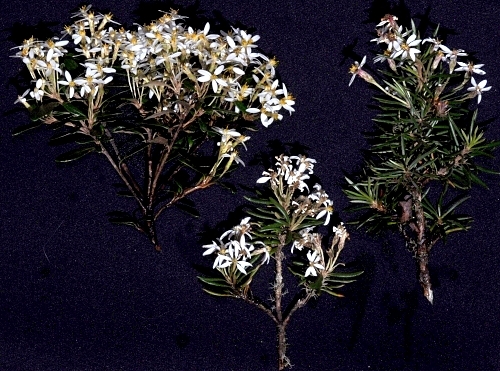 I present a case using a Tasmanian example – the Olearia daisybushes. Olearia is a large and conspicuous genus of shrubs in the sunflower or daisy family (Asteraceae) with some 23 species in Tasmania of which 8 are endemic to Tasmania (not counting subspecies). Two of the endemic species are of interest in this post: Olearia persoonioides (Geebung Daisybush) and Olearia pinifolia (Prickly Daisybush). Both are common and largish daisybushes that grow in subalpine woodlands. Whilst botanizing at various spots around the Central Highlands I stumbled upon the two species of daisybushes growing in close proximity in the understorey of a eucalypt woodland. They were both in full flower. At the same time I also noticed numerous specimens that looked like intermediates between the two. 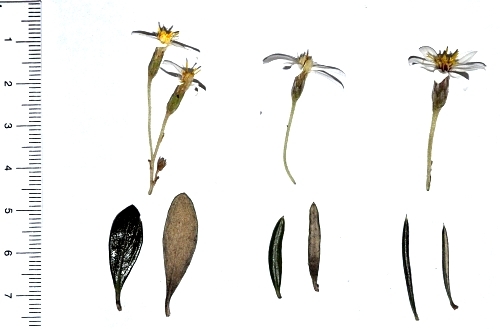 While this intermediate specimen deserves much more detailed study, I have prepared a set of photographs and made a table of the characters comparing the two daisybush species with the intermediate specimen. Many additional aspects of the morphology of the intermediate specimen deserves study. For example, the morphology of the flowers and fruits (achenes) needs to be examined in greater detail. 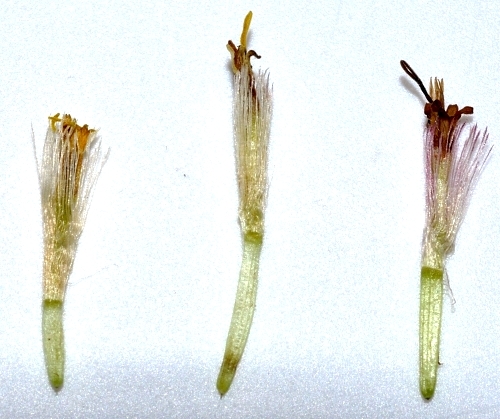 Other studies like chromosome counts might also be helpful in determining the hybrid status of the intermediate specimen. A trip to the herbarium is in the works! This entry was posted in Asteraceae, Botany, Common and Unappreciated, Hypotheses, Key Characters, Plant Morphology, Shrubs, Tasmanian Endemics and tagged Asteraceae, central highlands, Central Plateau, daisybush, Geebung Daisybush, hybridization, Olearia persoonioides, Olearia pinifolia, Prickly Daisybush, Shrubs, subalpine woodlands. Bookmark the permalink.